Everytime I show her a new title featuring Mario’s dinosaur buddy she always responds with the same line, “Oh, that Yoshi is my favorite. He’s just so cute!” Then I play through a few levels as she sits and comments on his adorable qualities. She’s not wrong. Yoshi is an undeniably charming little hero and Nintendo has somehow done the unthinkable in Yoshi’s Woolly World. They’ve made Yoshi even cuter. But AAA titles can’t get by on cuteness alone, so the real question is if Woolly World is more than just a pretty face. There’s a strangely comforting aspect to playing Woolly World. It’s a bit hard to explain. Due to the game’s lack of time limit there’s no real need to rush through levels. Assuming you’re not on one of the few self-scrolling stages you have plenty of time to poke around and smell the roses. Roses that are probably made of yarn and spout gems in a rainbow cascade. Woolly World is a game that just seems to exude simple joy. It’s comforting and feels like a title that was put together by a team who really wanted players to get lost in the beauty of a handcrafted environment. It’s this factor that makes me want to replay levels over and over, looking for new details and secrets. I guess it’s no coincidence the game was created by a studio named “Good-Feel”. It’s impossible not to compare Woolly World to 2008’s Wii classic Kirby’s Epic Yarn. They have strikingly similar visual styles and feature many of the same type of craft-related gimmicks such as unraveling threads, zippers, hand-stitched baddies and more. Epic Yarn worked well due to the fact that the Kirby universe is already so cute and cuddly. Woolly World feels the same. In fact I think they may have even out-cute-ed Kirby, as impossible as that may sound. It looks phenomenal. There are most likely better looking Wii U games on the market if you want to talk about frame rate, but Woolly World is certainly one of the most attractive titles to ever hit a Nintendo home console. This is mostly due to meticulous detail. The stitching on the sides of platforms, the perfect unravel of enemies being gobbled up, the clouds hanging by strings in the background - they all add to the illusion of a world completely crafted by hand. It may seem mind-numbingly juvenile, but the playful universe Nintendo has put forth is so awe-inspiring that it’s hard to look away. As mentioned above, Yoshi’s newest outing can be a very tranquil and inviting experience. This is largely in part to the very melodic soundtrack. The game’s loading music almost put me to sleep a few times, not out of boredom, but because it’s just so darn relaxing. Many of the levels have a very simple acoustic charm, forming one of the most chill soundtracks for a title in the last few years. Just take a listen. Oh yeah, that’s the stuff. Some light and fluffy beach music. You can almost feel the spray of the knitted ocean lapping at your feet. Occasionally the game kicks the action into high gear and delivers a more intense rendition of a Yoshi classic or even a new tune. Take the unfortunately named “Lava Scarves and Red Hot Blarggs” for example. It’s likely the most intense song of the game, and a great representation of how far in the opposite direction the music can go at times. The Woolly World soundtrack is a whole lot of smooth listening with a nice touch of rock and roll. A soundtrack that will surely find its way onto my iTunes playlist in the days to come. It’s one thing to make a world based on craft supplies, it’s another to actually use those aspects in gameplay. Woolly World never seems to run out of tricks, but uses what it has sparingly. New mechanics don’t stick around for too long, but give you enough of a taste (get it?!) that you’ll be fully satisfied. The game relies heavily on the classic Yoshi abilities - licking, eating and throwing eggs (which are simply balls of yarn this time around). These are the aspects of gameplay that don’t ever go out of style as the game moves forward, but are used in new ways to adapt to the ever changing landscapes. All stages are based on a specific theme or mechanic that usually ties into the world involved. If the stage is based on windmills then you’ll be stringing together windmill blades by throwing balls of yarn, and leaping from said blades to the mainland. It’s a simple and effective way to bring in new obstacles and enemies. The variety is staggering for a title that seems to be over a bit too quickly. One of my favorite stages (seen in the video above) has Yoshi clinging for dear life to a curtain as it whips through the jungle. Players must time jumps and decided which curtain to leap towards next. It’s one of few levels where a quick decision may lead to your ultimate downfall, as once a curtain is touched it moves quickly out of reach. It’s fast and it’s entirely enjoyable, a level you don’t expect due to the games often slow-paced nature. Upon completion players will immediately want to jump back in to take another ride. This may seem like an odd point, but I was very excited that Yoshi had the ability to be defeated on his journeys. This stems from the a-little-too-easy mentality of Kirby’s Epic Yarn, which refused to let players meet their demise. Kirby would simply lose some of his jewels and be placed back in a safe spot. Thankfully Woolly World doesn’t do this. Yoshi can bite the dust and players will be forced to start from their last checkpoint, giving them a reason to time to their jumps and keep their health up. Much like previous Yoshi adventures, and Nintendo adventures in general, there is plenty to discover as players traverse each new stage. Your main two objectives are to find smiley flowers and yarn bundles. The former will help you unlock each world’s bonus stage, and the latter will knit together a new playable Yoshi. Individual Yoshi have no specific advantages, but it’s fun to switch out your designs on the fly. Just don’t pick two Yoshi who look alike when playing co-op. Trust me on this. Aside from the two major collectables there are various gems and jewels strewn throughout the stages for players to snag. If you grab the right ones (and you can tell by looking for an extra sheen) you’ll unlock special Woolly World stamps that can be used in the Miiverse. As someone who rarely uses the Miiverse it wasn’t a huge incentive, but it didn’t stop me from going out of my way to nab hard to reach gems. There’s just enough to collect that carefully playing through a stage a second time can usually net you everything you need. Not to mention some of the collectables are decisively well hidden. Look in the sky! It’s a bird! it’s a plane! It’s... a green dinosaur who has transformed into a plane. How unexpected. Well, maybe it’s not too unexpected. This is Yoshi we’re talking about after all. He’s been pulling off stunts like this since his first official adventure as a star in Super Mario World 2. Transformations are back, and in a big way. Sometimes literally big in the case of Mega-Yoshi. Though some forms are a bit strange (an umbrella?) they all work wonderfully well in their short-lived stage sections. Each one forces players to rush forward, collecting gems, yarn bundles and time extensions as they race against the clock. Make it to the end in time and you’ll keep all your loot, but fail to cross the finish line and it’s back to the start with you. Each transformation (and there’s quite a few this time around) shows up roughly twice throughout the game’s 50+ stages, but they’re worth the wait. Aww, look at Poochi. He’s a good boy! Yes, he is! 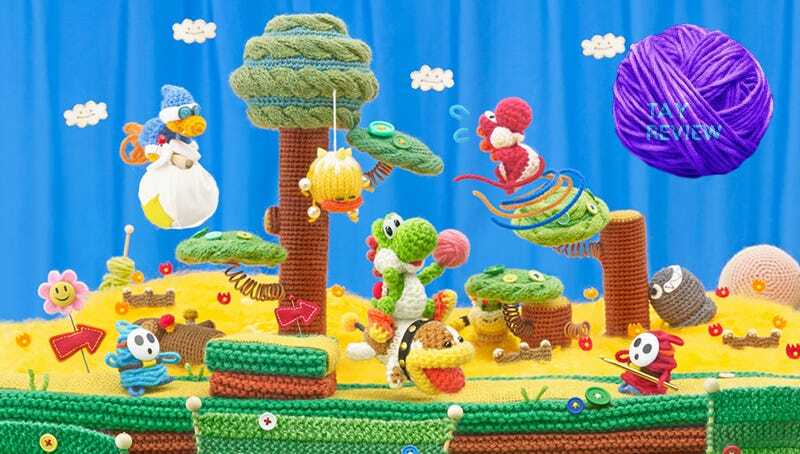 It’s wonderful to see Yoshi’s huge-lipped dog make a return to form in Woolly World. Not only that, this time around you can bring Poochi with you for any level if you select his power badge (more on that below) before setting off. It will cost players a chunk of their gem collection, but that didn’t stop my wife from recruiting him for almost every stage. If you ever purchased a Yoshi title expecting to be truly challenged you may be delusional. Or five years old. No, Woolly World isn’t a very difficult game, though it doesn’t really need to be. There are plenty of times you’ll find yourself momentarily stumped by a puzzle or on the verge of death by a pesky enemy, but they are few and far between. The most difficult aspect of the game usually falls under two categories - “How do I reach that?” and “How do I get in there?”. Luckily, the game is not easy to a fault. It’s not so uncomplicated that you can breeze through every new stage without the occasional challenge arising. Children and the gaming inept should be just fine, and if they’re not they can always switch on “mellow mode”, giving Yoshi more life and the ability to continuously fly. Struggling players can also use their collected gems to equip special “Power Badges” which can do anything from making Yoshi flame retardant to adding a gem magnet ability. If you’re not up to conquering a land filled with knitted enemies alone there’s always the option of couch co-op play. No online here. There are a multitude of different controller set-ups and players can hop in and out pretty easily. I played a good 70% of the game with my wife by my side, as co-op platformers are one of the few genres she wholeheartedly enjoys. Co-op play seems to hit two different extremes throughout each stage - unbridled teamwork-related joy and murderous backstabbing rage. Before my wife and I had even made it through the first stage I had already dubbed the game “marriage poison” and told her that if she didn’t stop eating me and spitting me off cliffs I was going to leave her. That may seem like an extreme reaction (and I was just kidding), but getting in your partner’s way happens often and can lead to some extraordinarily frustrating situations. I’d be lying if I said I wasn’t disappointed in last year’s poorly named Yoshi’s New Island for the 3DS. The game featured a smattering of classic Yoshi action, but suffered from being far too short. I completed it in under five hours, a disheartening length for a game based on one of the best platforming titles of the 16-bit era. Woolly World fairs far better than New island, but it still falls a bit short of being completely satisfying when it comes to longevity. Like most first-party Nintendo titles of 2015, Woolly World has some built-in amiibo functionality. Players can scan in dozens of their amiibo to unlock special Yoshi who resemble said figures. It’s pretty nifty, espcially if you ever wanted to play as a Yoshi who looks like Star Fox. And who wouldn’t? If you’re the type of person who looks at Yoshi’s Woolly World and thinks it would be an enjoyable experience then you’re probably correct. It’s far and away the best Yoshi title since the days of the Super Nintendo, and one of the best platforming titles in recent memory. It may look a bit too easy and childish, but in the end Woolly World is a title that knows how to use its clever visuals and evolving mechanics to craft a game worth exploring. I highly recommend it to anyone who has a Wii U handy. For a second opinion on Yoshi’s newest outing check out the Kotaku proper review by Keza MacDonald.